Once upon a time there was a family that really wanted to build a greenhouse (pretty much just me). It was going to be about 15′ x 20′, made out of recycled windows and other scavenged building materials. I really wanted to have a place in the challenging New Mexico climate to nurture young plants and be able to expand the regular growing season. After debating the merits and disadvantages of various places in our yard we chose a site for the future greenhouse. I spent a couple months of evenings and weekends flattening the site and digging a trench by hand. 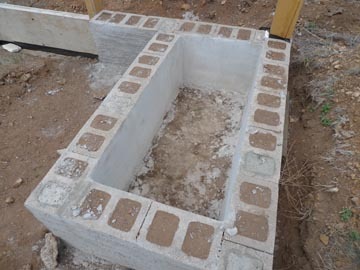 Next, I used a bunch of styrofoam forms (think giant legos) that Molly got from a concrete contractor to insulate and form the foundation walls that run from the footer to the top of the trench. We only got corner pieces (whadya expect? they were free) so I took the pile of corners, cut them up and fit them together to make the foundation walls. Molly helped me pour the foundation over the course of three weekends. We created a ridiculously over sized foundation for the requirements of such a light structure. The concrete cost about $600 which used up our entire building budget for the year. The only visible result of all this labor and money was a rectangular perimeter of concrete at ground level. That was Phase 1. Phase 1 was three years ago. As time passed other projects took precedent and the weeds took over their previous home again. In the winter we would dream about getting the greenhouse finished but there would be 3 feet of snow on the ground. We had a milder winter this year and in January I decided that I was going to get my greenhouse. Instead of using the $600 foundation we had already, I decided I was going to make an entirely different structure in an entirely different place. As Molly watched and bit her tongue I started making plans to put an addition on the south end of our house that I could put up over the course of a couple weekends. My ideas was that it would be faster to build (so it would actually happen) and it could help heat the house plus one wall was already built. We even had a garden bed there already. I spent a day transplanting the chives and swiss chard that were hanging on and taking out a fence and gate that enclosed the garden. My day of prep taught me a valuable lesson. Even though that south facing garden got sun in the summer in the winter the angle of the sun was low enough that the trees blocked any direct light on my proposed greenhouse. So much for plan B. Back to Plan A! 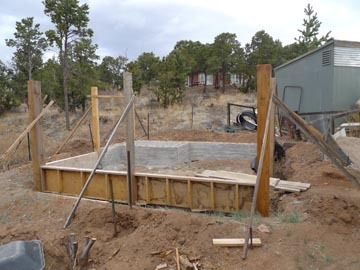 I pulled up the weeds and shoveled out the dirt that had accumulated on the foundation. With only a vague idea of what the final shape of the building is going to be I put in posts at the corners and middles of each wall. I want a structure that is attractive to look at but also very energy efficient. 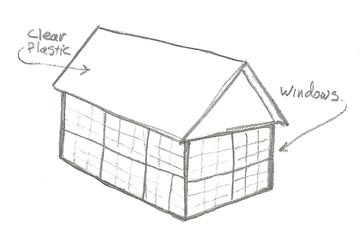 Originally I was going to build a classic house made of windows but after reading a book on solar greenhouses from the library I decided that maximizing the solar gain by extending the south facing roof down lower than I had planned was the way to go. 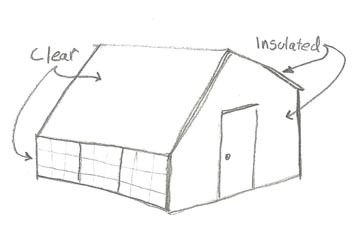 I’m also insulating the north facing roof and all the walls except the southern one which will help significantly in retaining the heat gained during the day. I have 8′ poles sticking out of the ground right now but the south wall will end up to be about 3′ tall and the North wall 5′ or so. The lower part of the north wall is made out of concrete block and has an integrated pond. I back-filled the block with rammed earth to add mass to help store heat. 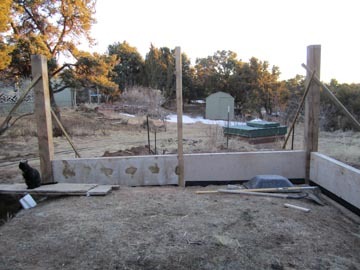 The bottoms of the rest of the walls are made with re-purposed plywood concrete forms I got from the Re-Store that were cut to fit and bolted to the columns to help stabilise them. They will get insulated with styrofoam insulation. The remainder of the north, east and west walls will be finshed with papercrete block. The south wall will be glazed with windows taken from an old fire lookout station. I had my spurt of construction activity in January and then it snowed. By the time February arrived I needed to shift my focus to setting up an indoor seed starting station and getting planting beds built for the Spring. Once again the greenhouse sits… patiently waiting for Phase 3.